Thomas Gutierrez, an assistant professor of Physics at California Polytechnic State University, transcribed the Standard Model Lagrangian for the web. He derived it from Diagrammatica, a theoretical physics reference written by Nobel Laureate Martinus Veltman. In Gutierrez’s dissemination of the transcript, he noted a sign error he made somewhere in the equation. 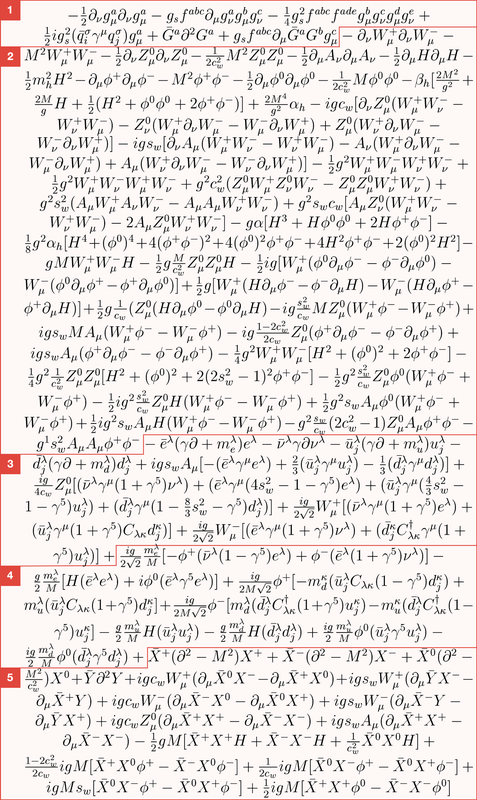 FYI : "Standard Model of particle physics written in the Lagrangian". Link: https://www.billtoole.net/wordpress/all/standard-model-of-particle-physics-written-in-the-lagrangian/.